TORONTO, ON, November 5, 2018 – Equifax Canada today released the results of a generational survey* and proprietary data that tracked credit scores over the past decade that suggests there may be good reason for the financial optimism many younger Canadians say they are feeling. 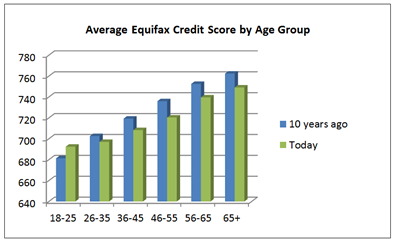 Ten years ago the average Equifax credit score for younger adults (18-24) was 681, while the same age group, the youngest Millennials of today, have on average a credit score of 692. All other age groups have seen a small decline over the same 10-year time frame. Generally, credit scores range on a scale from 300 to 900, the higher, the better. Over 660 would be considered good by most lenders. Financial optimism abounds within the broader group of Millennials (18-34) of which 82 per cent say they are optimistic about their financial future versus 73 per cent of the general population. Of concern, however, 27 per cent of Canadians aged 45-54 say they are not able to save on a monthly basis. Likewise, 35 per cent of Canadians say they make just enough to cover their expenses and 17 percent say they can’t cover their expenses. It’s even worse for the youngest of the Millennials (18-24), 34 per cent of whom say they can’t cover their expenses. This sentiment is echoed somewhat by older Millennials (25-34), as 45 per cent think their standard of living is worse compared to their parents (at the same age) and more than half of younger Millennials (18-24) don’t feel they have enough information to make financial decisions (54 per cent). Total consumer debt continues to climb and is now in excess of $1.864 trillion according to Equifax Canada’s Q2 Consumer Credit Trends Report. In particular, mortgage debt continues to grow at a constant and robust pace. Unusually, however, Equifax data suggests that mortgage volumes are being driven by the oldest age group 65+, showing increases of 59 per cent in total trades and 91 per cent of total balances over the past five years. While 75 per cent of respondents are saving a percentage of their monthly income, 20 per cent are not saving at all. 40 per cent are saving less than 10 per cent of their monthly income; 26 per cent are saving in the range of 10-25 per cent and only 9 per cent are saving more than 26 per cent. 47 per cent of those making less than $40,000 annually indicated that they are not able to save money on a regular basis. When it comes to retirement, 72 per cent of Millennials surveyed said they expect be financially comfortable and the youngest of the Millennials (18-24) were the least likely to expect to work well into their retirement years (34 per cent). Older Millennials (25-34) are the most likely to expect to work into retirement (55 per cent). If gifted $5,000, 29 per cent of respondents would put the money into savings; those 18-24 led the way at 32 per cent.Millennials, however, would also have the hardest time in cutting back on the following expenses: Eating Out (33 per cent), Morning Coffee (13 per cent) and giving up Netflix (11 per cent). *An online survey of 1527 Canadians was completed between August 3rd – 7th, 2018, using Leger’s online panel. The margin of error for this study was +/-2.5%, 19 times out of 20.